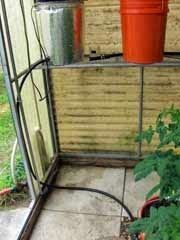 As promised, here's another update on our self-watering container garden, in particular the one Bill set up in the greenhouse. There are actually two separate systems, one the floor and one on the shelf. 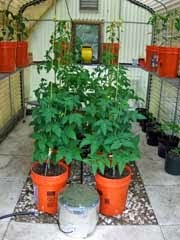 We planted tomatoes in the floor containers and peppers in the shelf containers. It's important the pots are level. This way, the water moistens each container equally. 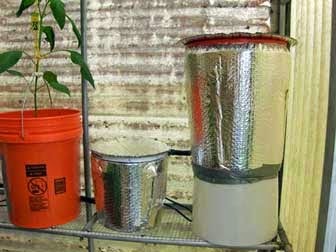 The larger water reservoir contains the water with VermaPlex® added. This enriched water feeds into the smaller "control" reservoir, maintaing the exact amount of water that feeds into each container. These reservoirs are covered with reflective bubble insulation, keeping the water nice and cool. Nifty. 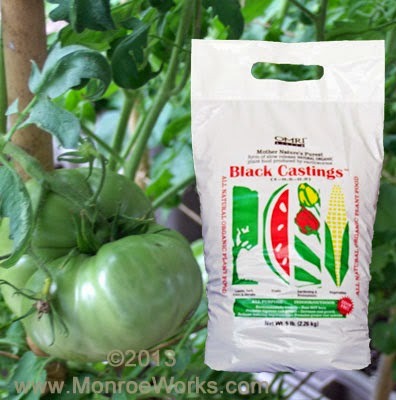 The potting soil in each pot is continuously supplied with moisture and liquid fertilizer. 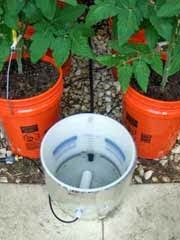 This constant moisture is especially important for tomatoes since damage occurs the instant tomato wilt. 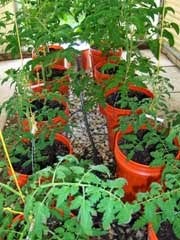 With this system, these tomatoes never wilt (although the same cannot be said for ol' Bill).